The challenge: Keeping the front passenger dry when driving your S4 at full speed in choppy water. The solution: Outfitting your S4 with a spray shield that’s big enough. Wavewalk S4 outfitted with a full size spray shield and carrying a wheel cart on its deck. This wheel cart has an extension that can fit into the second slot in the S4’s front deck. We used a 48″ x 24″ x 0.093″ Makrolon (Polycarbonate) sheet cut into three sections to create a 90″ long, 16″ high spray shield. This material is available at Home Depot. We assembled the sections using Goop adhesive and rivets. We attached the spray shield to the S4 deck using eyelets and short bungees. This full size spray shield effectively protects from spray the passenger sitting in the front of the cockpit, and it further enhances the seaworthiness of your S4. Warning: Stay away from Acrylic sheets because this material is too rigid for this kind of application, and it will develop cracks as soon as you start cutting it. Spray shield for my Wavewalk S4? The spray shield that Wavewalk developed years ago for the 500 series is made from a 48″ x 12″ Polycarbonate (PC) sheet. This accessory bends around the front of the W500, and stops spray from getting into the cockpit from the space between the front hull tips, as well as from their sides. Since there isn’t that much difference in design and size between the W500 and W700, this spray shield works for the latter as well, and it allows for driving both motorized kayaks at high speeds in choppy waters. But the S4’s front deck is less effective for blocking spray generated on the sides of the boat while it hits waves in diagonal. This is by no means a major problem, and the worst outcome can be that a passenger sitting at the front of the cockpit could get a little wet when the boat goes at high speed in choppy water. Since the S4 skiff is 9″ wider than the W500, a 48″ long spray shield bent and attached at the front of its cockpit won’t bend enough to protect both its front and its sides. 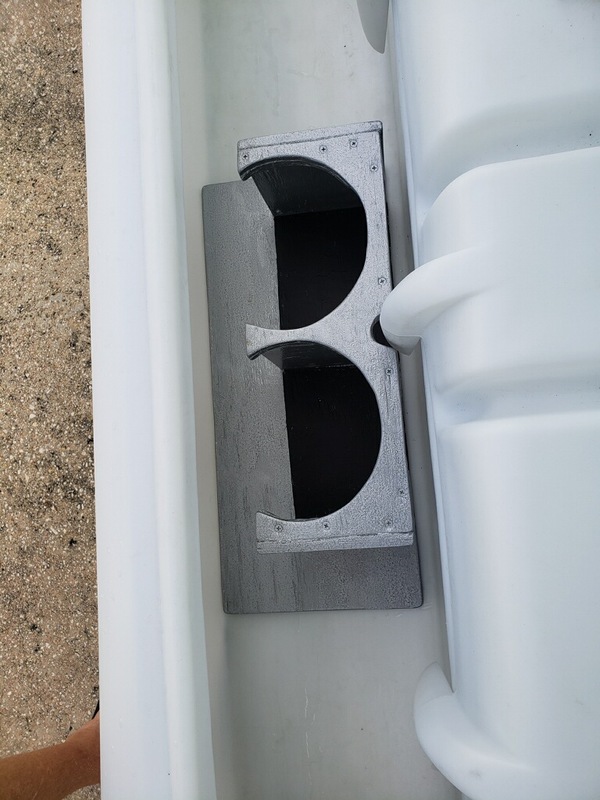 To achieve their goal, an S4 owner who wants to outfit their boat with a totally effective spray shield would have to make one from two sheets of 48″ x 12″ Polycarbonate – One sheet in the center, and a 24″ x 12″ extension riveted to each side of that central sheet, forming together a 96″ long sheet. 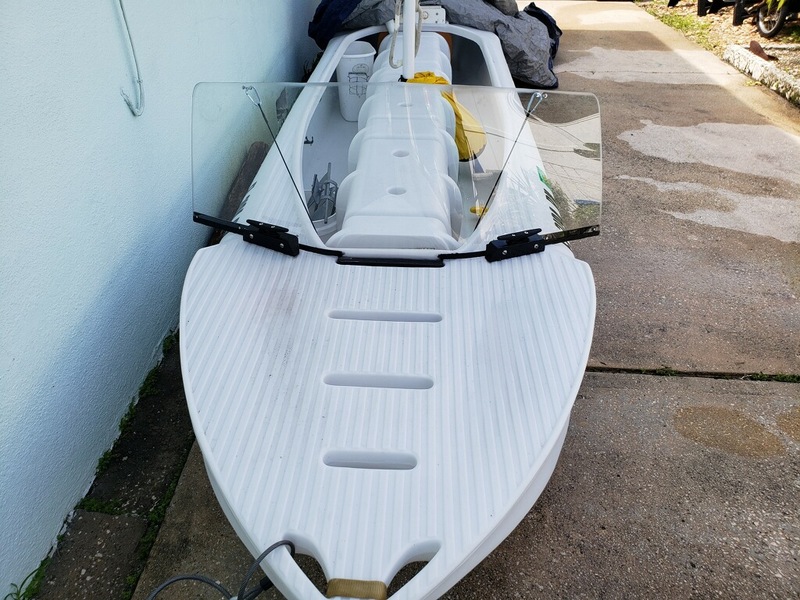 The DIY designer can cut the Polycarbonate, and reduce the height of the spray shield’s ends, and thus give the final product a cool, professional look that’s higher at the center and tapering down on both ends, namely backward when attached to the kayak’s cockpit (See images below). Drilling holes in a Polycarbonate sheets is easy, and so is riveting lashing hooks to it. These hooks will serve to attach the spray shield to the deck with a shock cord (bungee), in a way that makes attaching and detaching easy and quick. Other methods can serve as well to attach the spray shield to the S4. We recommend using Polycarbonate sheets that are 0.1″ thick or slightly thinner, in order to keep the end product lightweight and assure its flexibility. Polycarbonate (PC) sheets are not expensive, and they can be purchased online. We went out on the jetty for a bit and I shot a couple nice snapper. Candy cooked up the fillets. 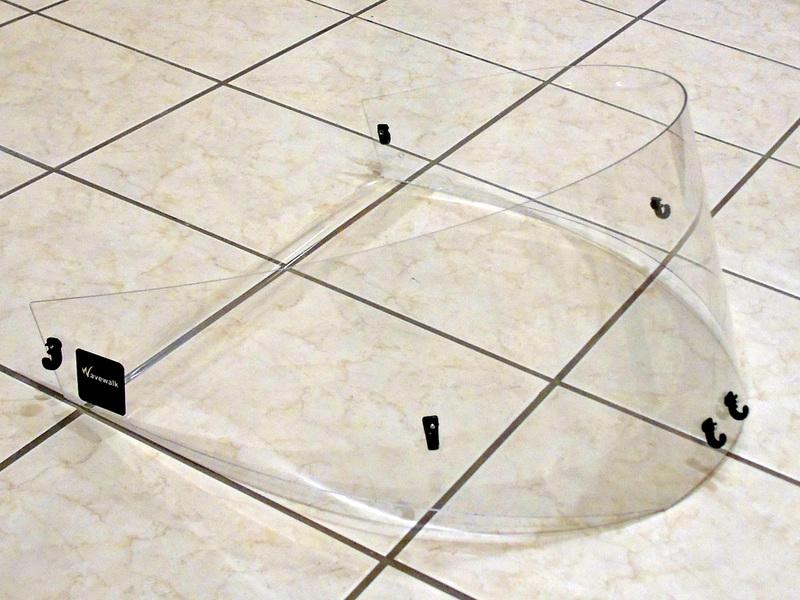 I made this spray shield from Lexan. Before I bend it around I wanted to see how it does out wide like this. I also finished my two tank holder for scuba diving. It just slipped right in. I painted plastic dip on top and on the bottom to keep it from sliding around, and cut a groove for the saddle bracket. It fits right in. We tested the spray shield today. 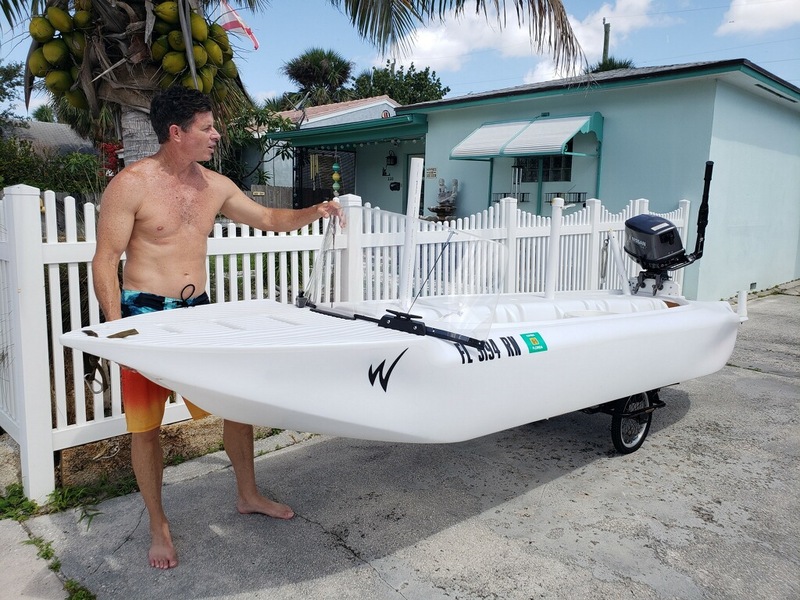 This review of the Wavewalk S4 kayak skiff was written by the guy who designed it, as well as the W500 and W700. Why this Wavewalk S4 review? Typically, kayak and boat reviews are written by clients who mean what they say, but aren’t necessarily professional, or by people that the manufacturer paid to review their product. The latter reviews are not objective to begin with, and in many cases they are not even professional. Designers seldom publish reviews of the kayak or boat that they designed. Other reviews commonly found on the web are fake, and they were written by individuals who are affiliated with the manufacturer of the reviewed product (fake positive reviews) or with their competitors (fake negative reviews). Some fake reviews that appear on websites that offer people to publish kayak and boat reviews appear to have been written under an alias by the website owners, probably in order to make their website look more popular than it is in reality. Wavewalk does not pay people to review its products, and it does not post anonymous reviews on websites that offer to do so to anyone who can come up with an alias and a few sentences. We think that such websites have a low credibility from the beginning, and their credibility has declined over the years, as people who read the reviews that these websites feature have become used to apply critical reading, and common sense. We decided to publish our own review of the Wavewalk S4 after it’s been out there for nearly a year, which is enough time for us to see what it can do, and what our clients think of it (Read S4 clients’ reviews » ). In this review of the S4, we try to compare our initial plans for this boat to what it does in reality, and we also try to look into the future, as much as possible, and see what it could still do. Many Wavewalk clients are interested in the design of kayak and small boats, and we think that such people may have a particular interest in reading this review. It takes close to a hundred thousand dollars to produce a new product such as the S4 in terms of time and money invested in the design and manufacturing of a capital tooling (rotational mold) for it. Once the product is out there, it takes more time and money to test and promote it. This means that before a small company decides to invest in the development of such a product, it needs to make sure that it has a good reason to do so, and preferably more than one good reason. 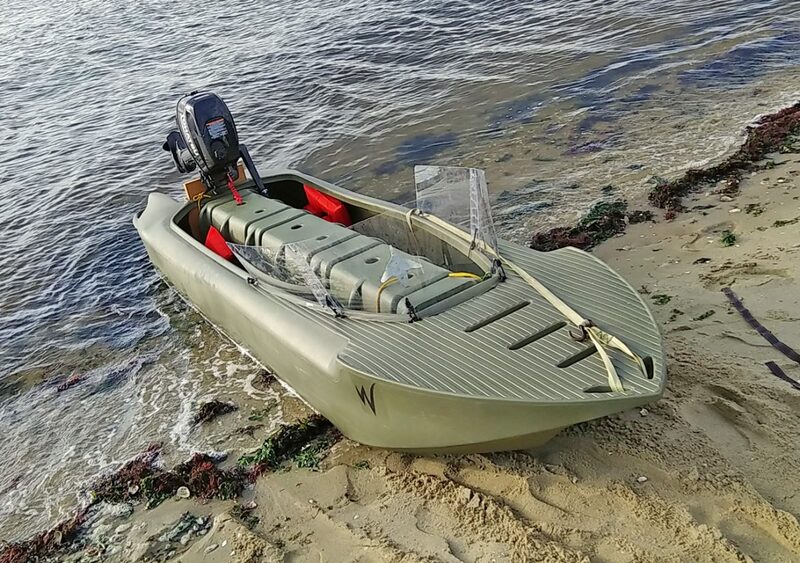 From the moment we launched it, the W700 became an immediate, remarkable success, both as a tandem kayak for touring and fishing (and hunting, photography, etc..) and as an ultralight portable motorboat / microskiff. This success gave us the motivation and the funds to take the Wavewalk concept to the next level. Our clients loved to motorize their W700, but few were willing to give up paddling altogether, and this convinced us that paddling was important, so we decided that our next product, namely the S4, will be more of a high performance, fast and seaworthy motorboat with a bigger payload capacity, but it would still offer good paddling capabilities as a kayak and a canoe. Another thing that our clients love in their W700 was the ability to car-top it without a problem, and this meant that the next Wavewalk had to be a car-top boat too. Jon boats – These popular small motorboats feature a generally flat bottom hull and a spacious open cockpit, and they usually offer sufficient stability for a crew of one person, on flat water. When the crew includes more than one person, or the water gets choppy, these boats tend to deliver insufficient stability, and generally speaking, they are not seaworthy, including bigger and therefore more stable models that are stable enough on flat water. 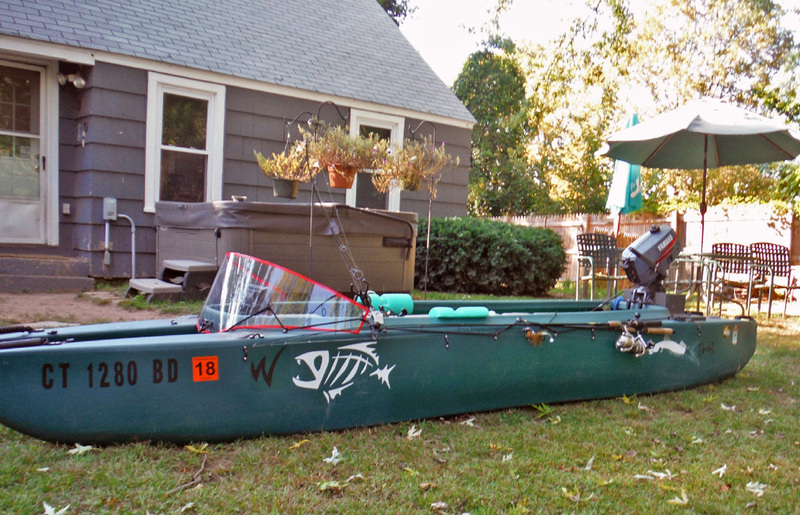 Since Jon boats are typically made from aluminum, they are not lightweight enough to be car topped, at least not by one person. And last but not least, paddling a Jon boat is not an option, at least not over a meaningful distance, so these boats are excluded from traveling in very shallow (dubbed “skinny”) water, and in water where much vegetation is to be found – unless they are outfitted with a surface drive (a.k.a. “mud motor”), which is typically more heavy than a standard outboard motor, and takes more room in the cockpit. The next Wavewalk had to offer as much carrying capacity as a good size Jon boat, while being at least as stable, and considerably more seaworthy. This had to be achieved while keeping the new product from being overly wide, since wide boats don’t paddle well. Needless to say that the new boat couldn’t be nearly as heavy as a Jon boat, since it had to be car-topped by one person. We achieved all this with the S4, and more, including successfully outfitting an S4 with a surface drive, as demonstrated by Chris Henderson, from Washington state. 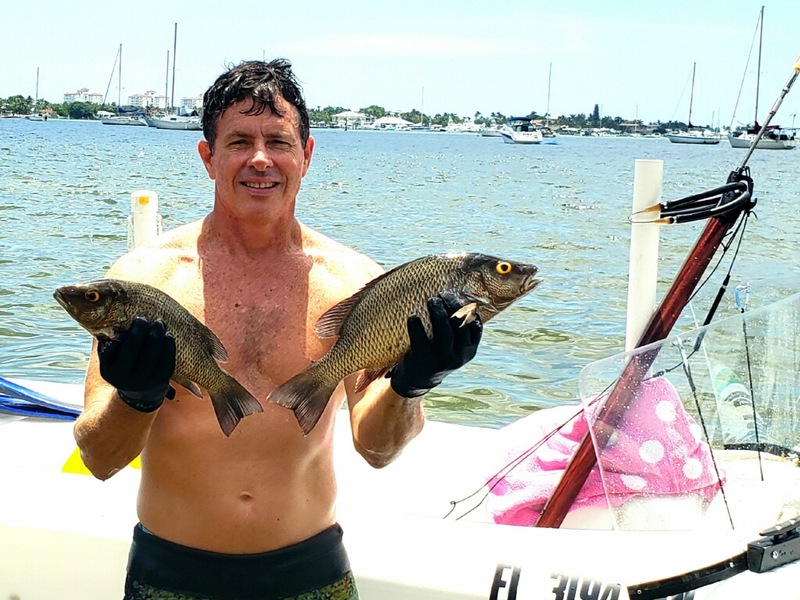 Microskiffs – Small skiffs (“microskiffs”) are generally similar to Jon boats, and they too are designed mainly for fishing on flat water. The main differences are in the material used to make skiffs (typically fiberglass), and typical additional deck features and structures. 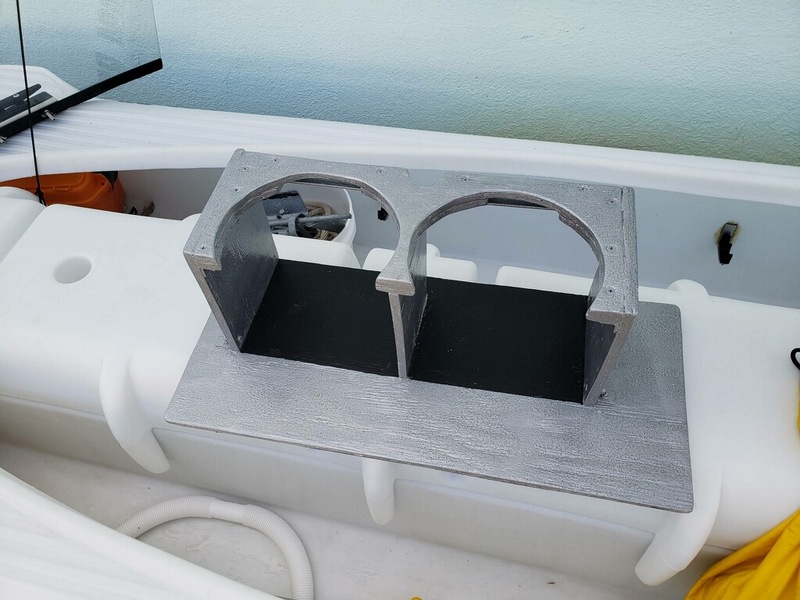 These differences reflect the fact that microskiffs are used primarily in saltwater, which is corrosive for aluminum, and the fact that people who fish out of microskiffs like to practice sight fishing. 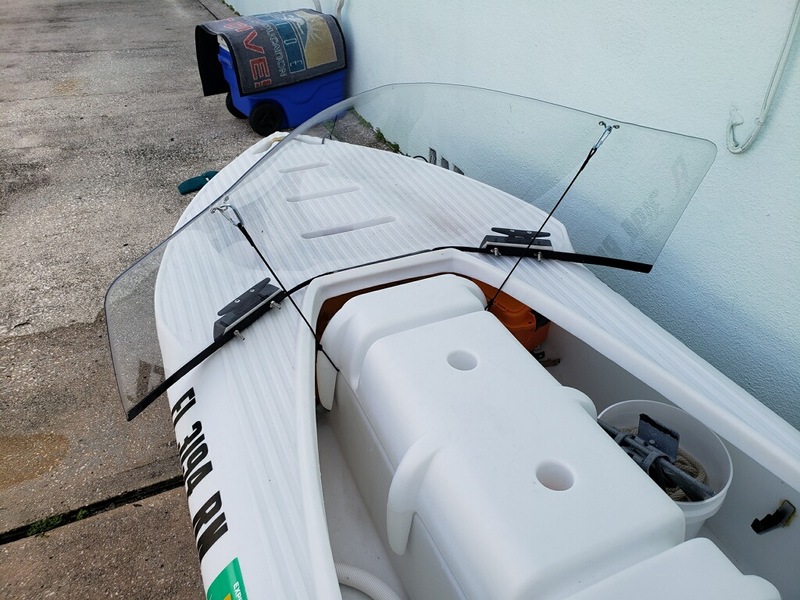 Microskiffs don’t paddle well, to say the least, and they are too heavy to be car-topped, including a product that’s essentially a rotationally molded motorized board for a single user who’s not particularly heavy, and who fishes in flat water only. The next Wavewalk had to feature a front deck, for casting, go as fast as a small microskiff, and be more seaworthy – All this while offering its users to launch anywhere, namely to transport it on top of a vehicle, and not by trailer. We did it. 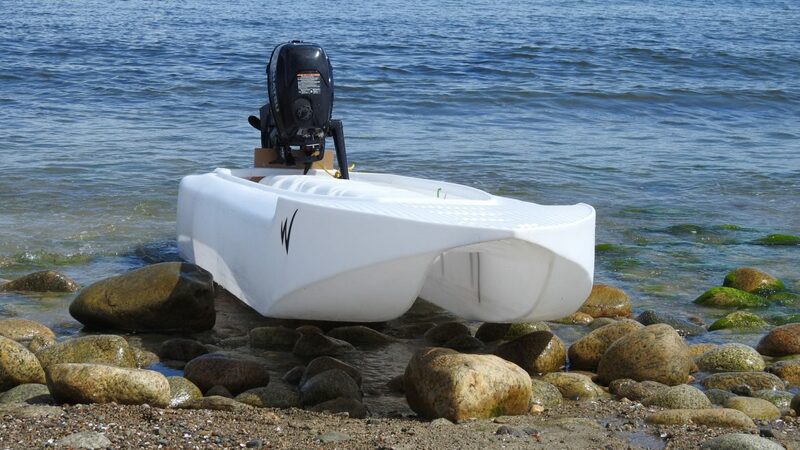 Motorized kayaks – Since both the W500 and W700 had already surpassed all products in this category, we deemed motorized kayaks too lame to serve as a basis for formulating requirements for a next generation Wavewalk. This is true for all but one pretty exciting kayak-like product for one person that’s officially designated as a boat, and is propelled by a 7 HP jet drive. When we weighed the pros and cons of a proprietary jet drive and compared them to the advantages offered by outboard motors, it became clear to us that the latter were the way to go, due to their initial cost, ease of troubleshooting, low maintenance, and high quality as well as effective local service offered to our clients. As for speed, we decided that the next Wavewalk would have to be at least as fast as that exciting jet-drive kayak-like watercraft, and if people had a special need to drive their S4 in extremely shallow water, they could outfit their new Wavewalk with a surface drive (mud motor), which works better than a jet drive, since it doesn’t get clogged. 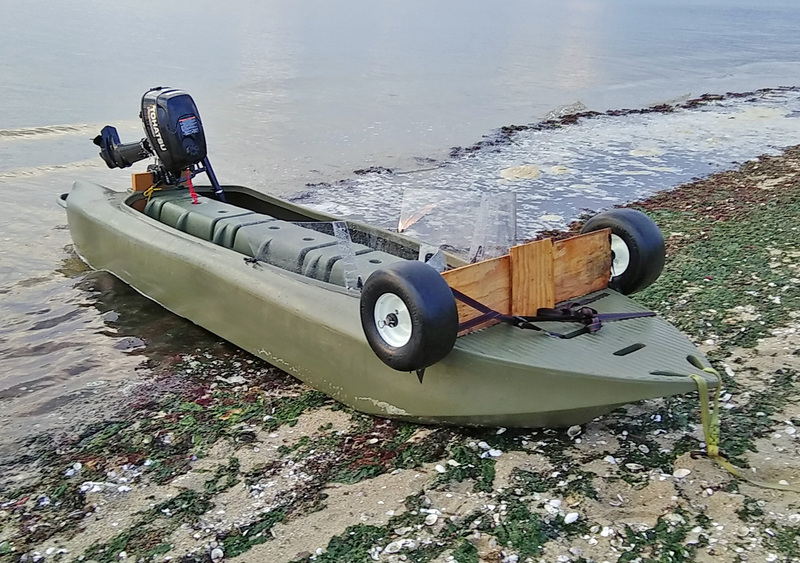 The next Wavewalk had to be a car-top boat, and portable in terms of carrying it over rugged terrain, something that said jet drive kayak-style watercraft is not. The new Wavewalk also had to be seaworthy, and transport at least two full size adult passengers, which that jet driven kayak style boat cannot do. We achieved all that. Personal Watercraft (PWC) – Such comparison may seem odd at first sight, but Wavewalks and PWC share one important feature, which is their longitudinal saddle seats that offer their users to balance themselves in the most intuitive and efficient way, and enhance their boats’ performance both in terms of stability and seaworthiness. In this sense, it was appropriate for us to think about PWC, and establish some requirements from the new product that would have nothing to do with fishing or paddling, but would go to what people like in PWC, namely speed, seaworthiness, and fun. We realized that in order for an S4 to reach speeds that are close to the speed of a small, basic PWC, the S4 would have to be outfitted not just with an extremely powerful outboard motor, but also with a proper steering and control system to go with it, be it a wheel or a bar, something that hasn’t been done, so far. Captain Larry Jarboe clocked 17 mph in an S4 powered by a 9.8 HP outboard motor, and the same boat was driven at full throttle offshore in choppy seas, with the drivers holding the throttle grip in one hand. In comparison, a typical PWC can go at 40-50 mph, and the faster ones can go at much higher speeds. Something to think about… On the other hand, an S4 is much less expensive than a PWC, including small ones designed for one person, and it is also more versatile. Inflatable dinghies – These fast, stable and seaworthy boats are popular with yacht and big boat owners, who use them as boat tenders. But these small inflatable boats are uncomfortable for their driver and passengers, who find it hard to stay dry in them, and they don’t paddle well. As for standing in them, it is not easy either. Compared to them, the W500 and even the W700 were inferior in terms of load capacity and speed, but neither of these is a problem with the S4, with its carrying capacity of 650 lbs and the high speed in which it can go, even in choppy water. Simply, the S4 is as seaworthy as a good size inflatable dinghy, while being drier, more comfortable, and offering better paddling and standing capabilities. The S4’s polyethylene hulls are more durable and dependable than the soft hulls of inflatable boats, and clients who use an S4 as a boat tender report the highest degree of satisfaction, even when they tow the S4 behind the mother ship, which is the kind of performance that we weren’t sure it would achieve when we started designing it. 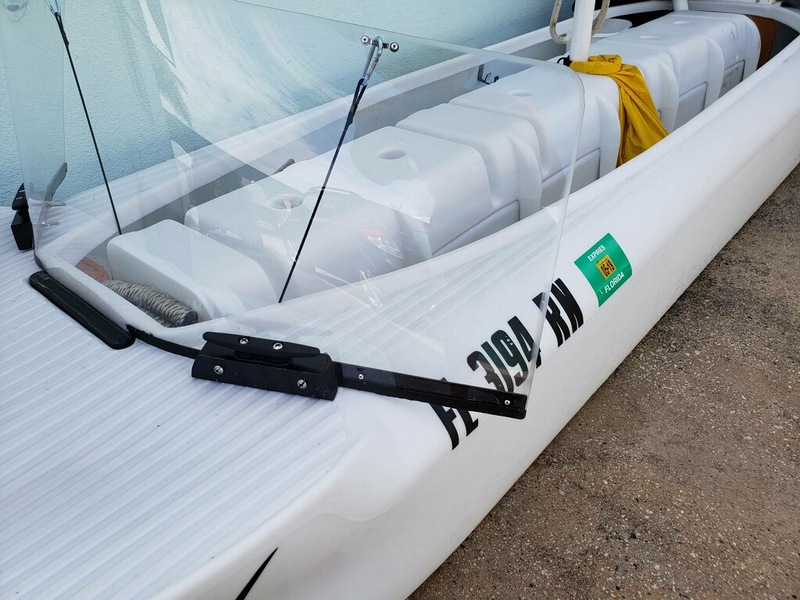 Keeping the kayak designation and paddling functionality – In order to make it easier for our dealers to sell the S4, and for our clients to register it, we wanted to keep its design within the requirements that would designate it as a kayak, and not as a boat, and that wasn’t hard to do. We also wanted to keep the S4 work as a paddle craft, which we achieved by making the sides of the cockpit slant, thus allowing the paddlers to move their paddles more closely, easily, and effectively alongside the kayak. A motorboat’s look – On the other hand, we wanted to distance the S4 as much as possible from the image of a kayak, because in comparison to motorboats, kayaks are sluggish, uncomfortable, unstable, and wet. Therefore, we got rid of all deck rigging items that are typical to kayaks, namely eyelets, hooks, bungees, rubber carry handles, and even flush mounted rod holders. The S4 comes with two integrated (molded-in) carry handles in its front tip, and a molded-in carry handle on each side of its rear hull tips. These molded-in carry handles are stronger than kayak handles that are riveted or bolted to the deck, they are as comfortable, and they look better. Keeping the S4 cost low – The rotational mold for the S4’s twin hull cost more that the mold for a typical full-size SOT kayak. We also had to mold the saddle for the S4, but luckily, we managed to design it in a way that allows us to use the same saddle as the one used in the W700. This saved us tens of thousands of dollars on a mold for an S4 saddle, and we were able to keep the S4 unit price within a reasonable range, considering its high performance in so many applications. Building it tough – Carrying heavier loads while going at higher speeds meant that the S4 would have to be tougher than the W700, which is why we decided to incorporate two wooden brackets in every S4, standard, compared to just one similar structural element in the W700. 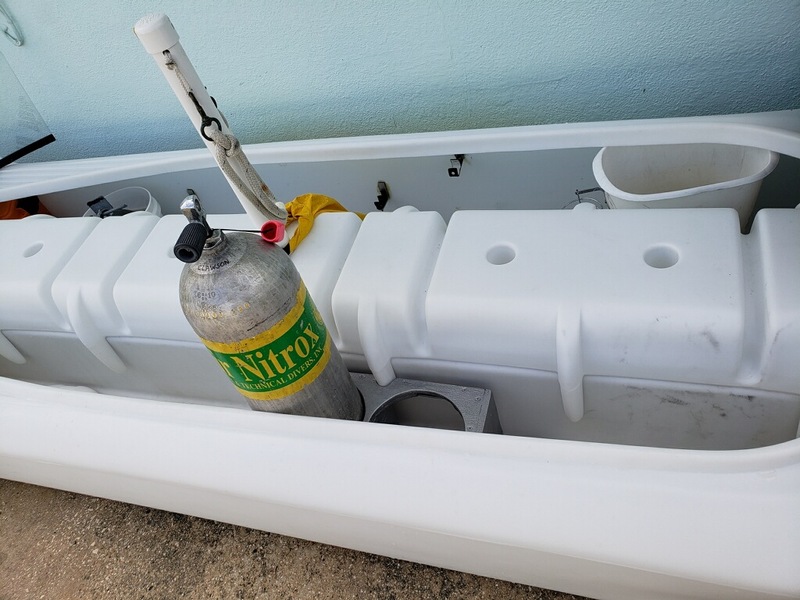 The motor mount challenge – The S4 is made from high density polyethylene, similarly to other kayaks as well as a motorized board offered as a one-person skiff. Polyethylene is a resilient material, which makes it highly resistant to impact, but this critical advantage comes at a cost, which is that polyethylene walls tend to be flexible relatively to similar structures made from more rigid materials, e.g. fiberglass and wood. We knew that a motor mount that would serve to attach to the S4 heavy and powerful motors that generate a lot of torque couldn’t be made from polyethylene only. If we wanted such mount not to flex, it should feature a totally rigid and very sturdy mounting plate, made from the right materials for the job. This is why we created the S4’s motor mount with a broad basis molded in polyethylene, and a mounting plate made from a wooden composite named Medium Density Overlay (MDO), which has served us successfully for years in the W500 and W700. The basis of the S4’s motor mount structure is firmly anchored on both its sides in the boat’s two hulls, and it is bolted both to the cockpit’s rear wall and to the saddle’s rear wooden bracket, whose top is inserted into the cockpit’s spray deflector (coaming). 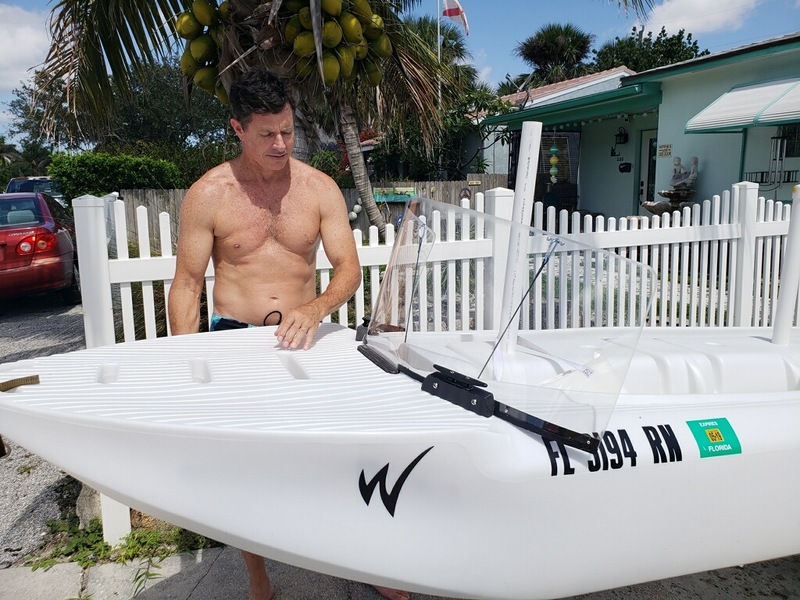 So far, this combination of polyethylene structures, wood composite board, and steel, has proved itself to work under difficult conditions, with powerful motors running at full throttle, and the boat going at high speed in ocean waves. The new front deck – The main challenge was to depart from the previous ‘catamaran’ look, and create a front that would still perform as a twin-hull (catamaran), but offer some protection from spray as the boat goes in waves at high speed. 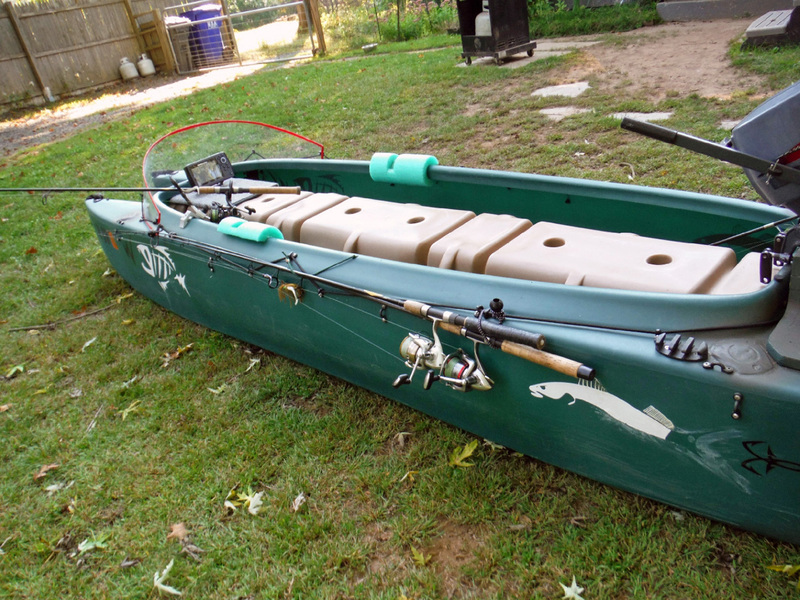 The totally redesigned bow had to feature a front deck that would serve as a casting platform, similarly to casting decks that skiffs feature. Since we knew that the S4 would serve crews of two and possibly three anglers, a deck extending in front of the cockpit would also serve to put more distance between crew members, and thus make the boat both more functional and more comfortable for them to fish from. This is to say that the S4’s new style of front deck is the result of both aesthetic and ergonomic, namely practical considerations. Developing these ideas and turning them into a computer aided design (CAD) file required months of hard work, plenty of problem solving, and innovative thinking. Displacement hull vs. planing hull – Understanding this subject requires some knowledge in kayak and/or boat design. The problem we addressed was that paddle craft (canoes, kayaks, etc.) travel at very low speeds, and the most efficient hull form for such low power propulsion and low speeds is called a displacement hull. In contrast, motorboats travel at much higher speeds, and people who drive them like to travel in a planing mode. The most efficient type of hull form for a small motorboat is a type of hull called planing hull. The S4 was required to serve both as a paddle craft and a motorboat, and do well in both applications. We realized that unlike the W700, most people who use the S4 would choose to motorize it, so we designed its hulls in a way that would offer top performance with a powerful motor, and still paddle well enough, and this is basically what the S4 has achieved in reality – One person can paddle it effectively and easily without reaching high speed, but they can also drive it with an outboard motor that’s powerful enough to propel bigger and heavier boats, and go at speeds that are considered high even by small boat standards, and inconceivable in kayak terms. Being big for a kayak, the S4 paddles better with a tandem crew than it does in a solo mode. It paddles equally well in canoeing and kayaking modes. In sum, the W700 is a great kayak that you can effectively motorize, while the S4 is a great motorboat that you can effectively paddle. It’s a subtle difference that’s worth remembering if you’re not sure which of these two models is better for you. Launching the product, and testing it – We launched the S4 in May of 2017, and since then, the S4 has kept growing in terms of proving what it’s capable of doing. We were pleased to see that a 214 lbs guy could easily stand with both feet in one of the S4 hulls, and turn around, without flipping the boat, and without even making it tilt by much. We were more pleased to see three adult paddlers standing in it and paddling without any problem. But we were astonished to see three full-size guys fish standing out of a motorized S4, with one of them landing a good size fish in the boat. Many thanks to Mike Silva for these amazing pictures! We loved watching the videos that showed the S4 driven through lily pads, propelled with a surface drive powered by a 6.5 HP motor. But driving an S4 powered by a 9.8 HP going at full throttle was a blast, and it was such a smooth drive that it certainly opened the door for testing it with more powerful motors, as a couple S4 owners already said they will do. Multi-boat configuration – Another innovative and inspiring development was Captain Larry Jarboe’s S4x3 multi-boat, composed of a motorized S4 hip-towing (side towing) an S4 on each side, and thus allowing the driver to transport a much larger number of passengers, in full comfort, and with the stability of a large size pontoon boat. Captain Jarboe uses the S4x3 multi-boat for his guided diving tours in Key Largo. Big boats, seaworthiness, maintenance, etc. – Interestingly, the S4 is already used, successfully, as an alternative to full-size skiffs. Its users prefer their S4s to the large size boats that they had previously used because of its easy launching, shallow draft, and better seaworthiness in choppy water. Indeed, we found that if you happen to get seasick in a boat going or anchored in the chop, riding the saddle of an S4 would instantly cure you, whether you’re driving it or just taking a ride in it as a passenger. The S4 is practically immune to other motorboats’ wakes, including big and fast boats traveling at a short distance from it, and this is not an exaggeration but an accurate description of a pleasant reality. And the S4 works as a paddle craft, so that it’s practically impossible to get stranded at low tide when you fish from it. Another reason to prefer the S4 over a full size boat is that it’s totally maintenance free, and if you’ve never owned a boat, it would probably be hard for you to appreciate the importance of this fact. Spray shield – It turned out that when one person drives the S4, even at high speed, and even in the chop, the hulls and front deck deflect much of the spray that’s generated when they hit waves. However, when a passenger sits in front of the S4 driver, their weight lowers the bow, and it tends to generate more spray when it hits waves. And this is when a spray shield can still be useful. A new type of watercraft – The S4 has already shown that it’s a new type of watercraft with a performance envelope that sets it apart from all boats of similar size. But it still has room to grow, in the sense of showing that it’s capable of more. We’ve already mentioned more exploits with mud motors, as well as bigger and more powerful outboard motors. We’d also like to show how a sculling (shell rowing) coach from Massachusetts uses his S4 as a coaching boat because he’s found that it generates a much smaller wake than other boats of similar size, and a small wake is the name of the game when coaching this sport is concerned. On the other side of the performance spectrum, we should find an opportunity to run the S4 in rough seas with inflatable flotation modules attached to its sides, RHIB style (RHIB stands for rigid hull inflatable boat). And on a completely different angle, we’re waiting for clients who use their S4 in whitewater, as a guide boat and a raft, to send us pictures too. Extreme efficiency with a 1:6 weight to load ratio (payload ratio) – The S4 weighs a little less than 100 lbs without a motor, and it can carry a payload of over 650 lbs including a motor. This is a solid 1:6 weight to load ratio that shows how efficient the S4 design is. I put the W700 together on how I’d like to set it up for fishing. Not sure if I’ll leave the windshield on, but I’ll know better after my next outing. One thing I know for sure, if anyone wants those flush rod holders, don’t do it, if they plan on adding a motor, they get in the way of the mounts. I cut mine down and capped them so they won’t leak, and they’re are out of my way for storage. I have a couple of showings with some friends who want to see the W700, hopefully it will bring in some sales.